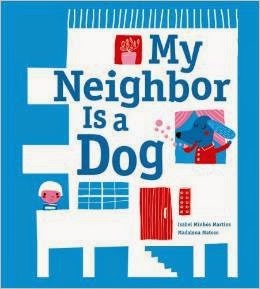 My Neighbor Is a Dog by Isabel Minhos Martins, illustrated by Madalena Matoso. So many interesting neighbors are moving in! A dog, an elephant couple, a crocodile...but the boy's parents are miffed (never mind that they are giraffes) and pack their bags. In his heart, the narrator knows he will return...someday. This Portuguese import is a subtle story about acceptance that uses a mod style to be peachy instead of preachy. Recommended by The PlanetEsme Plan. Link for information, please support your local independent bookseller.